Postal forms 2162 and 1508 are the only proof that the rifle was shipped and received. You don' t like the evidence right. So you just make it disappear. Can it GET any more hilarious on a Pot/Kettle scale than the above comment by Mr. ABO himself? If there's anyone who doesn't like the evidence and wants it to vanish (or become ALL FAKE) in the JFK & Tippit cases, it's DiEugenio. That's why he pretends that all of the Oswald-incriminating evidence is phony--every last piece of it. You are fast becoming Rodney Dangerfield. You've already surpassed Dangerfield in the comedy arena, Jimbo. You've reached greater comedy heights--you're Richard Pryor, Eddie Murphy, and the great Phyllis Diller all rolled into one pathetic and laughable ABO conspiracy-happy monger. Congrats. Then where are they [the gun forms]? Here again, kids o' the corn, we have example #1,299 of DiEugenio's patsy-framers acting like retards. They want to fake a paper trail so that everyone will believe that their patsy, Mr. Oswald, ordered and paid for and received Rifle C2766 and Revolver V510210, but they forgot to fake the firearms forms. That was sure a great bunch of evidence-planters you've got there, Jimbo. They couldn't fake anything correctly, could they? Speaking of Dangerfield....maybe he was the top-level idiot who was trying to frame Oswald by doing things that nobody would have done to frame him. Would the CTers now like to abandon the oft-repeated theory about how Oswald could have walked into any gun store in Texas and walked out with a gun that could never be traced? IOW -- If there should be forms and documents signed by the purchaser for LHO's mail-order purchases, then surely those same forms and signatures would also be required to exist in a transaction that took place in a brick-and-mortar gun shop, right? And if I'm right, then it means Oliver Stone got another thing wrong in his 1991 comedy film in the scene where Lou Ivon states that Oswald could have purchased a completely untraceable weapon by merely buying it in a gun store. WOW!!!! Why did Armstrong even bother, if this is the reaction to the body of research done on the origin of "the rifle", by Mr. von Pein and Mr. Mack? Mr. Mack has an opportunity to distance himself from remarks attributed to him by Mr. von Pein, but von Pein has no such option. Disclaimer: If you take seriously in this instance, the opinion of von Pein, and the alleged opinion of Mr. Mack, none of the following can be considered, it has to all just disappear! Longer rifles must now weigh the same as shorter rifles, is that correct, Mr. von Pein? Klein's, from about 5 years ago. ....NOTE: Neither the FBI nor the Warren Commission determined if Crescent Firearms was Klein's only supplier of Mannlicher-Carcano's from 1958 thru January, 1962. A single Klein's purchase order form provided several columns, which allowed for multiple orders of guns, from the same supplier, on the same form. As Klein's was selling out of their 40 inch rifles, they placed an order for 400 Model 91TS Mannlicher-Carcano's from Crescent on January 15, 1962, at a cost of $7.50 each. Klein's assigned this 36 inch carbine catalog number C20-T749, which appeared on both their purchase order form (Klein's order #1222) and their advertisements in the American Rifleman from March, 1962, through February, 1963. A handwritten notation on Klein's purchase order indicates these 400 rifles were received on January 22, 1962. In March, 1962, Klein's began offering a 4 power scope with their 36 inch carbine, catalog number CT-T750, for $19.95. On April 13, 1962, Klein's placed a second order, on the same purchase order (order #1243) for 200 Model 91/38 rifles, at a cost of $8.50 each. On April 13, 1962, Klein's placed a third order, on the same purchase order (order #1243) for 100 Model 91/38 rifles, at a cost of $8.50 each. From March thru June, 1962, Klein's offered only a 36 inch carbine, catalog number C20-T749, for $11.88. In August, they changed the catalog number to C20-T1196 and raised the price of their 36 inch rifle to $12.88, which they continued to sell thru March, 1963. We have determined that Klein's stocked and sold only 36 inch Mannlicher-Carcano rifles through their mail order division from March, 1962 thru February, 1963. Klein's allegedly shipped a 40 inch rifle to "A. Hidell," yet we know from advertisements in American Rifleman this model was not available until April, 1963. Where and when did Klein's begin purchasing 40 inch Mannlicher-Carcano rifles, and in particular C2766? As Klein's was placing and receiving orders for 36 inch rifles during 1962, the 520 cartons of Mannlicher-Carcano's from the Elletra Fassio were still in storage at the Harborside Terminal warehouse in New Jersey. Among those rifles was a Mannlicher-Carcano, serial number C2766, in carton number 3376. Beginning in November, 1960, the Harborside Terminal billed Crescent Firearms a fee for storage based upon the number cubic feet used during a particular month. The number of cubic feet was calculated by measuring the length (3'5"), width (1'2") and heighth (11") of the 520 cartons and appears on Harborside Terminal's billing statement, originally dated November 9, 1960. A cardboard carton which measured 41 inches long would have contained 40.2 inch Mannlicher-Carcano rifles. Crescent's president, Louis Feldsott, told the FBI that his company stored the 520 cartons of imported Mannlicher-Carcano rifles at the Harborside Terminal warehouse until such time that they received a sufficient number of orders from retail customers. After receiving an order, Crescent would arrange for delivery of the rifles and immediately send an invoice to their customer. On June 18, 1962, Crescent sold and arranged for a shipment of rifles to Klein's Sporting Goods. Included in this shipment was a 6.5 mm Mannlicher-Carcano, serial number C2766. FBI agents Martin and Francis Grealy interviewed Crescent president Louis Feldsott on the evening of November 22, 1963, in New York. SA Grealy wrote in his report of that interview, "He (Feldsott) also made available 10 shipping slips reflecting the carton number and the rifle numbers in each carton." One of the shipping slips Feldsott gave to SA Grealy was Crescent's shipping form number 3620. This was a copy of the shipping form, filled out by a Crescent agent in Italy in the presence of Italian authorities, that was affixed to carton number 3376, which contained C2766. These 10 shipping slips with the serial numbers of 10 rifles on each slip tell us that at least 100, and perhaps all of 5200 rifles aboard the Elletro Fascio, were 40 inch 6.5 mm Mannlicher-Carcano's. NOTE: Louis Feldsott provided an affidavit to the Warren Commission (Vol XI, p 205 ) in which he stated, "On November 22, 1963, the FBI contacted me that asked if Crescent Firearms, Inc., had any records concerning the sale of an Italian made 6.5 mm rifle with serial number C2766. I was able to find a record of the sale of this rifle which indicated that the weapon had been sold to Klein's Sporting Goods, Inc., Chicago, Illinois on June 18, 1962. Further records involving the purchase, sale, and transportation of the weapon have been turned over to the FBI." Crescent's records relating to the purchase, sale and transportation of C2766 to Klein's on June 18, 1962, have never been made public. The Warren Commission never acknowledged or sought to explain the existence of C2766 on June 18, 1962, even though they published Feldsott's affidavit. The last shipment of Mannlicher-Carcano rifles to arrive in the US from Italy were those aboard the Elletro Fassio. When Klein's began receiving 40 inch Mannlicher-Carcano's from Crescent in June, 1962, they probably placed these rifle in storage as they were currently advertising and selling only 36 inch Mannlicher-Carcano's. After selling out of the 36 inch rifles, Klein's began advertising and selling their 40 inch Mannlicher-Carcano's in April, 1964. C2766 was shipped to "A. Hidell" between April and November, 1963. William Sucher, owner of Empire Wholesale Sporting Goods, of Montreal, told the FBI that his firm purchased hundreds of thousands of Mannlicher-Carcano rifles from the Italian government. He said that since many firms manufactured the same rifle, the same serial number could appear on the same style of rifle. In June, 1962, Empire sold 700 Mannlicher-Carcano rifles to Century Arms, Inc. of St. Albans, Vermont (invoice #1078). James Ouimet, owner of Century, told the FBI a Mannlicher-Carcano, with serial number "2766" (no letter prefix "C"), was included in the shipment from Empire (invoice 1078). Century re-sold and shipped the rifle(s) to Aldens, of Chicago, on July 5, 1962." NOTE: The .38 caliber Smith & Wesson pistol allegedly used to kill Dallas Police Officer J. D. Tippit and a Mannlicher-Carcano rifle, serial number 2766, both came from Empire Wholesale Sporting Goods. Curiously, neither the FBI nor Warren Commission investigated, explained, nor addressed the probability that other Mannlicher-Carcano rifles had serial numbers "C2766." On June 18, 1962, Cescent Firearms sold a Mannlicher-Carcano, C2766, to Klein's Sporting Goods. Crescent's President, Louis Feldsott, provided FBI agents in New York with shipping form #3620 (1 of 10 forms), which showed Crescent's purchase, transportation, and sale of C2766 to Klein's. Crescent's shipping form #3620, which originated in Italy, was affixed to the outside of carton number 3766, which listed the serial number of 10 rifles, including C2766. The FBI used shipping form #3620 and deceived the Warren Commission and the public by claiming C2766 was sold to Klein's on February 7, 1963, INSTEAD OF ON JUNE 18, 1962. Fred Rupp lived and worked on Mink Road in Perkasie, PA, 12 miles north of Philadelphia, and 100 miles from the Harborside Terminal in Jersey City. According to the FBI, Rupp removed the first 170 cartons of rifles from the Harborside Terminal warehouse on August 29, 1962. He probably took the cartons to Perkasie, PA for servicing and repacking. After completing his work, he probably shipped the 170 cartons (1700 rifles) to Crescent's customer. Unfortunately, there are no bills of lading or documentation from Rupp that indicates which cartons or rifles were shipped to which customer. There are no carton numbers or serial numbers of rifles listed on any of the Harborside Terminal warehouse records for the remaining 350 cartons of rifles. Rupp removed an additional 90 cartons on October 4, 70 cartons on October 16, 64 cartons on October 24 and 40 cartons on October 31.The 40 cartons (400 rifles) removed by Rupp on October 31, 1962, and taken to Perkasie, PA, for servicing, may have filled Klein's order for 400 rifles (#1222), that was originally placed on January 15, 1962. Unfortunately, there is no documentation to establish when or to whom these rifles were shipped. After October 31, 1962, only 86 cartons (860 rifles) remained in storage at the Harborside Terminal warehouse. Rupp shipped some of these rifles to Klein's in January, 1963. On Klein's original order for 400 rifles, placed on January 15, 1962, there is a handwritten notation "order number 1222," and the date received-1/22/62. On the same order form, above the order for 200 rifles, there is a handwritten notation "order number 1243," and the date received- 1/24/63. On a carbon copy of the same form, above the quantity "200," there is a handwritten notation "3166 (Crescent's invoice number)," and the date of Crescent's invoice-1/6/63. On the same order form, above the order for 100 rifles, there is a handwritten notation "order number 1243," and the date received- 1/24/63. On a carbon copy of the same form, above the quantity "100," there is a handwritten notation "3178 (Crescent's invoice number), and the date of Crescent's invoice-2/7/63. According to the the Warren Commission, this was the order that originated with Fred Rupp and contained both carton #3376 and the Mannlicher-Carcano rifle, C2766. The Warren Commission and the FBI, however, had no shipping documents or bills of lading to support their claim. The FBI obtained an undated shipping document, allegedly signed by Fred Rupp, which showed that 10 cartons of rifles, weighing 750 pounds, were picked up by North Penn Transfer Company in Pottsville, PA. However, Pottsville is 60 miles northwest of Fred Rupp's hometown of Perkasie. The FBI next obtained the bill of lading from the North Penn Transfer Company, of Lansdale, PA. This document showed that on February 12, 1963, North Penn picked up 10 cartons of Mannlicher-Carcano rifles (100 total), weighing 750 pounds, from Pottsville. The bill of lading does not list any of the carton numbers, serial numbers of rifles, or have the signature of Fred Rupp as shipper. North Penn delivered the 10 cartons of rifles to Lifschultz Fast Freight in Philadelphia on February 13, for further shipment to Klein's in Chicago. On February 15, 1963, the 10 cartons of rifles, again with no carton numbers or serial numbers listed on the Lifschultz bill of lading, left Philadelphia bound for Chicago. Six days later, on February 21, Lifschultz delivered the 10 cartons to Klein's Sporting Goods, Inc., 4540 W. Madison St., Chicago. Did Klein's receive 36 or 40 inch rifles on February 21, 1963? The FBI, and later the Warren Commission, claimed that Crescent's shipping form #3620 proved that C2766 was sold to Klein's on February 7, 1963-INSTEAD OF ON JUNE 18, 1962. At this point, either Louis Feldsott or the FBI is lying about the date that C2766 was sold to Klein's. The same rifle could not have been sold on June 18, 1962, and again on February 7, 1963. Feldsott said he gave documents related to the purchase, transportation, and sale of C2766 to the FBI. But the only document known to exist is an undated transportation document-Crescent's shipping form #3620. In January, 1963, handwritten notations on Klein's order for 300 Model 91TS rifles, placed April 13, 1962, indicates these orders were filled. According to both the North Penn Transfer and Lifschultz bills of lading, the 10 cases of rifles (100 rifles) weighted 750 pounds, or 7.5 pounds per rifle. Each of the wooden shipping cartons was measured at 3' 5" long, 1'2" wide, and 11" high by the Harborside Terminal. When empty, each carton weighted approximately 12 lbs, not including packing materials for the rifles. Therefore, each Mannlicher-Carcano received by Klein's on February 21, 1963, weighed less than 6.3 pounds. According to the FBI, a 40 inch long Mannlicher-Carcano weighed 7 pounds, 11 ounces. One hundred such rifles, plus 10 cartons and packing materials, would weigh nearly 900 pounds-far more than the 750 pound shipment delivered to Klein's on February 21, 1963. It is therefore almost certain that Fred Rupp, North Penn Transfer, and Lifschultz Fast Freight shipped 10 cartons of 36 inch Mannlicher-Carcano carbines to Klein's in February, 1963. A 40 inch Mannlicher-Carcano, C2766, could not have been among these rifles. Tom, the information about Empire Wholesale Sporting Goods coincides with information that the late Gerry Hemming emailed to me a few years back. Hemming told me that, to discover where Oswald's pistol and rifle actually came from, I needed to forget about Klein's and Seaport Traders, and instead concentrate on a single source in Montreal. Since Hemming could be a bit of a BS'er--not unlike Mr.Von Pein--I nevr knew whether he was giving me good information or sending me out on a false trail. BUT if Hemming was correct--as opposed to the "could have" and "might have" and "must have" speculation of Larry Dunkel--it would certainly explain why certain documents sought by Jim DiEugenio and Gil Jesus haven't surfaced: it would be because they never existed to begin with. Of course, if Oswald DID obtain both firearms from Empire, it wouldn't necessarily rule him out as being the assassin of the two people he's accused of killing. It would only confirm that the Warren Commission and the FBI were liars...something the majority of Americans already suspect. Let me tell you what's bullxxxx, David. You are. WALDMAN 7 IS AN INTERNAL ORDER FORM GENERATED BY KLEIN'S OFFICE FOR THE SHIPPING DEPT.. WHEN THE OFFICE RECEIVED AN ORDER, IT THEN GENERATED AN "ORDER BLANK". THE INFORMATION GENERATED BY THE OFFICE ON THAT FORM IS CLEARLY TYPED BY TYPEWRITER--THE CUSTOMER'S NAME, ADDRESS, CATALOG NUMBER AND DESCRIPTION OF THE MERCHANDISE ORDERED. THE INFORMATION ON THAT FORM CAME STRICTLY FROM ORDER BLANK AND THE CATALOG NUMBER. It was a form that went from the office to the warehouse. Mr. BELIN. .......Now, I'm going to hand you what has been marked as Waldman Deposition Exhibit No. 7 and ask you to state if you know what this is. Mr. WALDMAN. This is a copy made from our microfilm reader-printer of Dallas, Tex. I want to clarify that this is not the order, itself, received from Mr. Hidell, but IT'S A FORM CREATED BY US INTERNALLY from an order received from Mr. Hidell on a small coupon taken from an advertisement of ours in a magazine. And it's a copy of a microfilm copy. NOT an original document. The ONLY proof that those weapons were actually shipped and received are the postal forms that were REQUIRED to be filled out BY LAW. And until you can produce those, you can't PROVE that those weapons were either shipped or received. Now go bullxxxx somebody who doesn't know better. 1) I have no idea why the envelope was postmarked in a different zone than the main post office. Perhaps Oswald bought the money order, took it back to the office and gave it to someone else to mail and it get sent from somewhere else? Or is there some standard post office explanation for such things? Just because some questions have remained unanswered doesn't mean sinister explanations are always the reason. 2) So what if Oswald turned down rides from time to time? Did he always refuse? No one knows. Did he accept rides from other than the two who asked him? Same answer. Since the walking distance was 30-35 minutes from J-C-S to the main post office, odds are he accepted the ride from someone or rode the bus unless, of course, he ran which would cut the time roughly in half. According to Marina's testimony, Oswald had a bus schedule and studied it a few days earlier, though that may have been for his plan to shoot Walker. So far, there's no reason to suspect a sinister answer. 3) While I don't have access to a 1963 bus schedule, I do know the city runs more buses in morning and afternoon drive than it does midday, so taking a bus was a reasonable alternative. 4) True, there's no evidence showing Oswald to have been anywhere but J-C-S that day, but do his time sheets list his working hours AND breaks - including lunch - NO. Of course not, they just show that he was paid to be at J-C-S for a full day.....and he was. 5) As for Oswald's J-C-S times sheet, researcher Mary Ferrell, whom I had great respect for, wrote, "OSWALD'S time sheet for March 12 is evidence that he probably lied sometimes about his hours. On the day he ordered the rifle, he signed in from 8:15 a.m. to 5:15 p.m., (Exhibit no. 1855, Vol. 23, p. 605)." She then wrote that the post office opened at 8am, after noting Harry Holmes testimony that the envelope was mailed in the early morning. The simple fact that Marina and Marguerite both admitted back then and for years later - I've heard the story directly from both women - that he posed for pictures with the guns he ordered trumps everything else. 6) Did Klein's send Oswald the larger rifle without asking? Maybe, or perhaps they enclosed a note explaining the substitution and Oswald threw it away? 7) However, I'm baffled at Gil Jesus' question about my credibility from the Jesse Ventura show. I simply told him - assuming he would ask - what I've said for years: I have questions about parts of the story, but I can't prove any of them. My honesty apparently went over his head. Gary's #1 explanation doesn't seem very likely (or logical) at all. Because why would Oswald have purchased the money order at the post office and then given it to someone else to mail when he himself (Oswald) was right there in the post office already? That makes no sense at all. I'm not saying that Gary's #1 explanation is totally impossible--of course it's not impossible, but it doesn't seem very likely or reasonable either. Everything else on Gary's above list, however, makes perfect sense to me, particularly his very good #6 point about the possibility of Klein's notifying Oswald in some manner that the rifle being shipped was not the exact same 36-inch model he had ordered. That, to me, seems very reasonable. And it also seems reasonable to think that Oswald would have had no really good reason to even care that the rifle he ultimately received from Klein's was four inches longer (and slightly heavier) than the thirty-six version he had originally ordered. Regarding the U.S. Postal Money Order that Lee Harvey Oswald used to order his rifle from Klein's Sporting Goods --- I'm just curious to know how it has been verified that Oswald purchased the money order from the MAIN STREET Post Office branch in Dallas, Texas -- vs. possibly buying it at a different U.S. Post Office branch closer to "Zone 12"? Is it the stamped "G.P.O." marking on the money order which signifies that the item was purchased (and stamped) at the Main Street Post Office? And does "G.P.O." stand for "General Post Office"? And would that mean he could have ONLY purchased it at the Main Street branch? I'm not saying that Oswald didn't get the money order at the Main Street Post Office, I'm just wondering the method by which it was positively proven he did get it there? I can find no specific reference in Harry Holmes' Warren Commission testimony as to how this fact was determined concerning where the money order was purchased. Holmes does indicate (twice) in his testimony, however, that it was obtained "at the main post office". But I can't find any info in his testimony about HOW that fact was specifically determined. Did the Main Street Post Office possibly retain a receipt of Oswald's $21.45 money order transaction? If so, I can't find anything concerning such a record of receipt in Holmes' testimony. "Postal Inspector McGee of Chicago called back then and said...they had received this money order on March the 13th, whereas I had been looking for March 20. So then I passed the information to the men who were looking for this money order stub to show which would designate, which would show the number of the money order, and that is the only way you could find one. I relayed this information to them and told them to start on the 13th, because he could have bought it that morning and that he could have gotten it by airmail that afternoon." So, what U.S. Postal Inspector Harry D. Holmes is saying there is that the money order that Oswald purchased on the morning of March 12, 1963, could actually have been sent via air mail (which it was) the NEXT DAY--on March 13th--and still have gotten to Chicago on the "afternoon" of March 13, the very same day it was mailed by air mail. But, quite obviously, Jimmy's beliefs do not square with the facts. 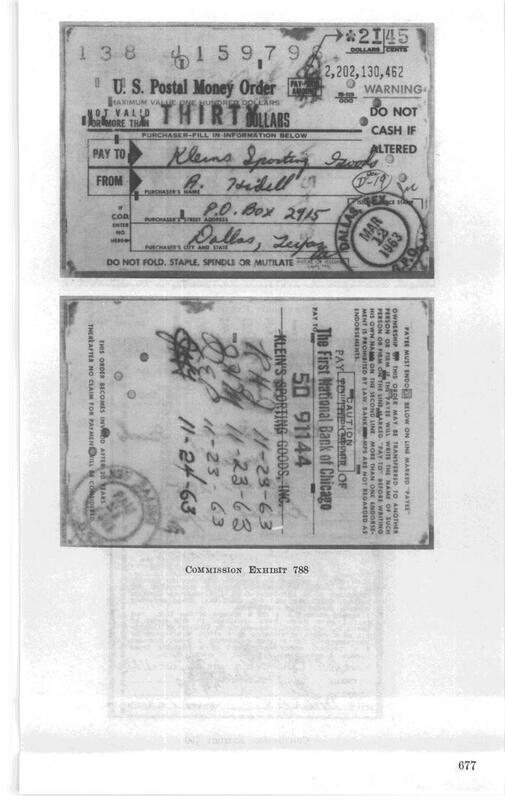 And while the business about the money order arriving and being processed and deposited by Klein's in 24 hours is, indeed, a fast transaction, the testimony of Harry Holmes (who was a UNITED STATES POSTAL INSPECTOR, so I think he should know what he's talking about when it comes to MAIL, AIR MAIL, and DELIVERY TIMES) indicates that Oswald's money order could, indeed, have been delivered to Chicago and properly processed in just 24 hours (or even less, per Holmes' testimony shown above). 5) As for Oswald's J-C-S times sheet, researcher Mary Ferrell, whom I had great respect for, wrote, "OSWALD'S time sheet for March 12 is evidence that he probably lied sometimes about his hours. On the day he ordered the rifle, he signed in from 8:15 a.m. to 5:15 p.m., (Exhibit no. 1855, Vol. 23, p. 605)." That's not true. Oswald's time sheet shows him at work at 8am on March 12th, not 8:15. CAN SOMEONE TELL ME WHAT THIS SPECULATION HAS TO DO WITH EVIDENCE ? Jim DiEugenio wouldn't recognize a guilty man even if he was apprehended with the murder weapon in his hands. Oh, wait a second -- that's the situation we have in the Oswald/Tippit case. The murderer is caught red-handed with the murder weapon in his hand, but DiEugenio would rather focus on the REA stuff. Lovely. This just proves that DiEugenio doesn't give a damn about the truth in this case. He just wants to create a loophole for his prized patsy to slide through. Who gives a damn whether he killed a cop? Right, JD? And, btw, since even you admit that the FBI didn't file any reports about going to REA, how can you know for sure if any REA documents DO EXIST or not? Maybe there is an REA document someplace with Oswald's or Hidell's signature on it. How would you know? BTW #2 -- There is absolutely no proof whatsoever that Oswald didn't put the name "Hidell" on the PO Box 2915 application. That document was discarded in May '63, and you cannot prove otherwise. And when the FBI stated in one of its reports that Oswald DID NOT put Hidell on the application, they were undoubtedly referring (by mistake) to the application for Oswald's Box 6225, which he rented on 11/1/63. That exact same mistake, incidentally, was made by a conspiracy theorist last year (possibly at this very forum), with the CTer insisting that the Box 6225 application was really the 2915 form, which is wrong. And Oswald wrote no names on the 6225 form. BTW #3 -- Addendum to the last BTW: If the FBI were the crooks and frame-up artists that you believe they were, Jim, then why on Earth would they have stated in a report that Oswald HAD NOT put the name Hidell on the Box 2915 application? If the Feds were so corrupt that they'd fake every piece of evidence in sight (as you, incredibly, believe they did), they would have undoubtedly lied their collective asses off about the 2915 PO Box form and they would have said Oswald HAD listed Hidell in order to further along the frame-up. Makes me wonder if a certain John Thomas Masen did business with International Firearms Company or Empire Wholesale Sporting Goods, LTD "back in the day".